The first Morris Minor Rally in 2008. A bit different to what we are used to. +30 degrees and sunshine. Arranged and sponsored by Classic Cars (Pvt.) (Ltd.) Pinnaduwa. 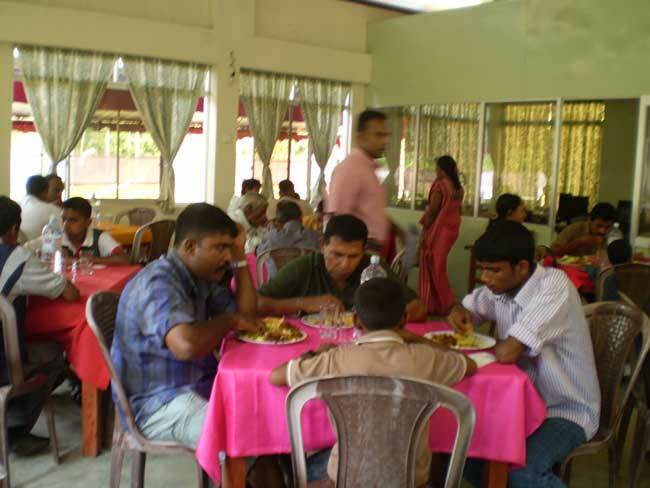 On Sunday the 27th of January we met at Rampath Hotel in Galle Fort. 20 cars and around 70 people. Two cars broke down on their way to Galle and did not come. Two were delayed on their way and drove direct to Pinnaduwa. At 10.00 we had tea and a snack at the hotel. Hot stuff burning in my mouth. I was driving my own 4-door saloon. It was a miracle that I managed. The clutch was very difficult. Engine, carburetter and distributor totally worn out. The gearbox a “search and you shall find” loudly screaming that very soon it will give in. Worn out tyres with visible threads. Wheels repaired by welding. 30 degree free paly in the steering. Hanging brakes. All in all a car I would never use on the road in Denmark, but still one of the better in the convoy. My car is to the left. 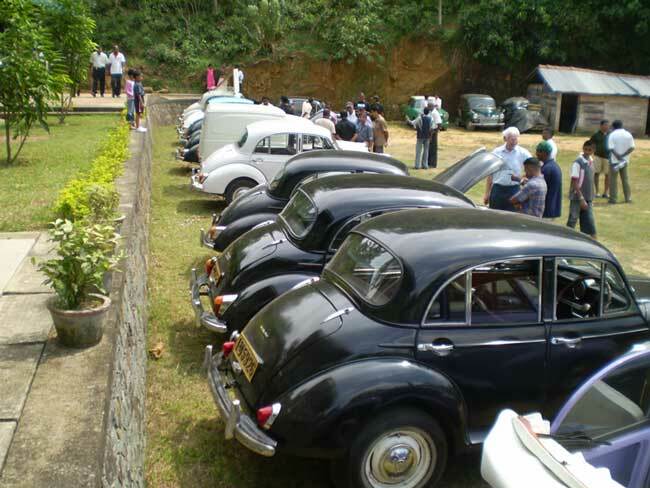 At 10.30 we drove in convoy escorted by the police through Galle town to Classic Cars in Pinnaduwa, around 12 km. It was a pleasure due to our police escorting and the convoy was intact all the way. Speed not over 30 km/h. The police men on their motor bikes were very efficient and good at leading the convoy through the traffic. They are used to clear the roads and protect important persons. I think they enjoyed a relaxed job.Same reaction from people along the route as we are used to. In front of the convoy a company car with a banner. At rear our mechanic in a van. At departure a Mini Moke joined, but it did not make it and was towed back home. All Morris Minors succeeded. 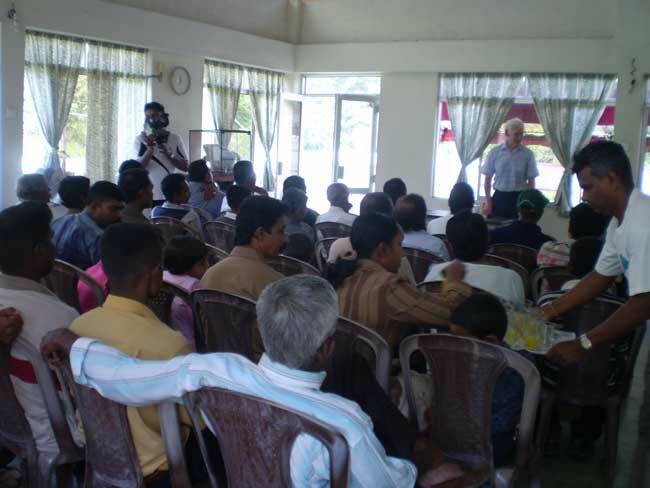 At arrival to the company premises the office building was cleared and chairs arranged so people could sit down and listen to my words of wisdom. After riding my hobby horse for a long time, people were showed around in the company and the usual chat around the cars started. Words of wisdom from the old man taken in with juice. Now time for food – very tasty and very different to our dish. No fork and knife needed for hot stuff. 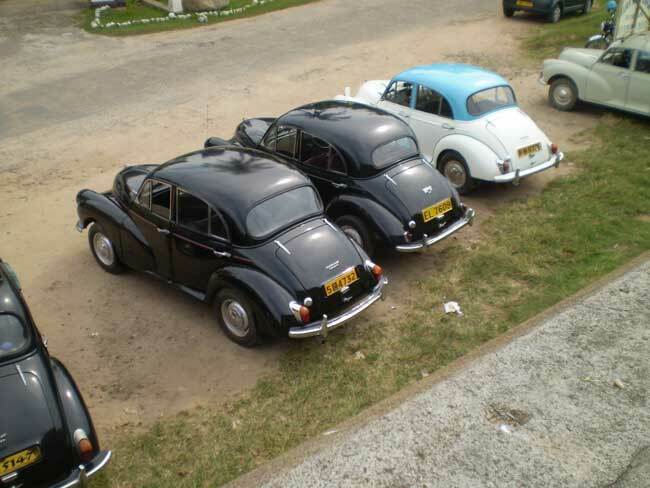 Whereever Morris Minor Owners meet, they like to show their cars and discuss matters. Around 3pm most people had left and I could relax. It had been a very interesting day and I learned a lot about the conditions for the Morris Minors, but hard work to be the centre of attention all the time. The entire event was filmed and I will have an edited copy this week. It looked very dangerous when the photographer on the rear seat of a motorbike was crossing the convoy and the traffic and I look forward to see the result of his efforts. This Morris Minor Rally was a success and we consider to arrange a Rally again the 25th of January next year. If you like to see creative solutions put a mark in your calender and start preparing in good time. It takes 3 to 4 weeks of driving if you dare. If not, you better go by airplane and participate without your car. There is a 99% guarantee for +30 degrees and sunshine. It is free to participate. The company paid Rs.76.800 (approx. 600 €) in total for meals, tea, escorting, souvenier and other things. The purpose of this rally was marketing. We are selling too little locally. 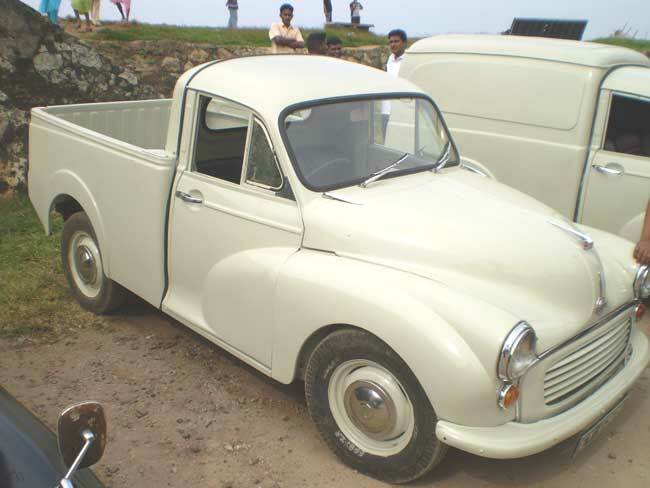 One of our news was the first Pick-up produced in Sri Lanka by us. First Pick-up produced by Classis Cars. We have learned that we, at least for a while, have to pay all the costs. If not, only very few will attend. There is no tradition for a Morris Minor Rally in Sri Lanka. We have had and will have a lot of publicity. The video will be sent to TV and they will broadcast a small part with their comments.